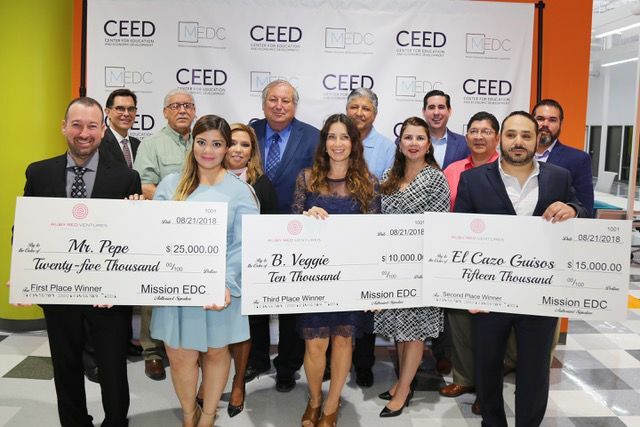 August 2018 recipients of the Mission Economic Development Corporation's Ruby Red Ventures Program included first place winners Jose Luis Lopez and Heidi Lopez of Mr. Pepe, second place awardee Alejandro Chavez of El Cazos Guisos, and third place recipient Maribeny Jenis of B. Veggie — all walking away with funding assistance from the corporation. Another three small businesses were recently awarded funding assistance from the Mission Economic Development Corporation as part as their Ruby Red Ventures Program. The three businesses were awarded a combined $50,000 through the program, which runs twice a year, according to a news release issued last week. The winners, Jose Luis Lopez and Heidi Lopez, own Mr. Pepe, a company that manufactures gourmet grilling sauces. They were awarded $25,000 that they will use to redesign the bottle for their product. The second place award, $15,000, was awarded to Alejandro Chavez, owner of El Cazos Guisos, which makes pre-packaged Mexican meals and stews. Chavez will use the funds to increase production. Maribeny Jenis was awarded 10,000 for third place. Jenis is the owner of B. Veggie, a company that produces natural fruit and vegetable juices using cold press technology. She will use the funds on a manufacturing facility. Ruby Red Ventures is a four-month program during which small business owners attend classes to help them develop a business plan. After the four months, they present their plan to a panel of judges who select the three winners.